Ernest Merritt was Emeritus Professor of Physics at Cornell University (1935-1948). He was the co-founder and co-editor of The Physical Review. He was also a charter member, and the first secretary, of the American Physical Society. His major research contribution was the extended series of investigations he did with Edward Leamington Nichols on the luminescent properties of over 100 materials: phosphorescence and fluorescence at low and moderate temperatures, the decays and recoveries, etc. April 28, 1865Birth, Indianapolis (Ind.). 1881 – 1882Studied at Purdue University, West Lafayette (Ind.). 1886Obtained ME, Cornell University, Ithaca (N.Y.). 1889 – 1948Instructor in Physics (1889-1892); Assistant Professor of Physics (1892-1903); Professor of Physics (1903-1935); Dean, Graduate School (1909-1914); Head, Department of Physics (1919-1935); and Emeritus Professor of Physics (1935-1948), Cornell University, Ithaca (N.Y.). 1893 – 1894Studied with Max Planck, University of Berlin, Berlin (Germany). 1893 – 1913Co-Founder and Co-Editor, Physical Review. 1914Member, National Academy of Sciences. 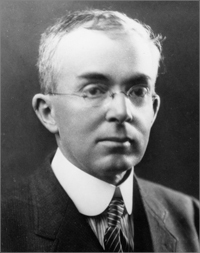 1914 – 1915President, American Physical Society. 1917 – 1918Member, Scientific Staff, Naval Experiment Station, United States Navy. June 5, 1948Death, Ithaca (N.Y.). Advised by Merritt at Cornell University, "The Hall effect and allied phenomena in silicon." MS advisor at Cornell University. Post-doctoral advisor at University of Berlin. Advised by Merritt at Cornell University. Instructor in Physics; Assistant Professor of Physics; Professor of Physics; Head, Department of Physics; and Emeritus Professor of Physics. President and Co-Founder and Co-Editor, Physical Review. Studied with Max Planck (1893-1894). Member, Scientific Staff, Naval Experiment Station. Arthur Gordon Webster papers, 1892-1920. Arthur Gordon Webster papers, 1893-1913. Earle Keith Plyler intellectual autobiography, 1962. Edwin Bidwell Wilson aeronautics and aerodynamics collection, 1904-1930. Karl Darrow correspondence relating to history of the American Physical Society, 1943-1968. Mary Anita Ewer papers, 1922-1936. Oral history interview with Henry Louis Brakel, 1965 November 10. Thermodynamics and cold light, 1994. Selected topics in the field of luminescence : report of the National research council, Committee on luminescence / by Ernest Merritt, Edward L. Nichols and C.D. Child. Ernest George Merritt Physics Today obituary.